Pool Live Tour is a real-time pool game, which you can play with other players of Facebook around the world. Simply login and you are ready to play this awesome pool game. This game is very simple and accessible for free too. Once you start the game you will get the option of multiple venues for multiple skill levels and also you will get the Tournament option for competition as well. But yes, in this game you will not get options for practice table and also you will not have the ability to set your own bets. The sad part is that there have been a lot of crash reports. Even though this game has some technical problems, but still this game is in top five games in the sports category of the famous social network, Facebook. This game has a lot of variations and levels to enjoy, once you start playing, you will surely get addicted to it. I would stand on my view that it is hard not to like Pool Live Tour, because of the attractive look and the amazing gameplay. The presentation is very clean and colorful, and I also found that the community is very friendly and helpful. The technical gameplay usually seems a little flawed, as I mentioned above that there have been many reports of some players not being able to load the game or crashing when they start this game. I have played this game many times, but I haven't experienced these particular issues till now, but anyhow, I am sure that you will be very happy to play this delightful game many times on Facebook. The audio of this game is also nice, but I do think that it may need some technical improvements soon. 1. 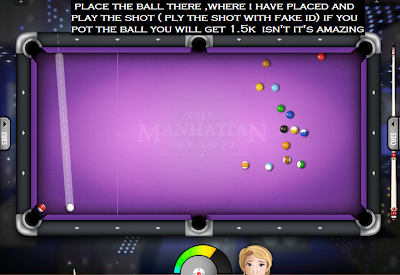 Pool Live Tour is a fun game and is nothing more than the simple old 8-ball billiards. If you know how to play it in reality, you won't have any trouble playing it online. But sadly, there are no multicolored balls here or specialty variations, you just have a black balls and all other same balls which you have to drop in any of the pockets. There will be some chances when you can add a spin to your balls but mostly there is nothing to add the complexity level of the game. 2. In the game of Pool Live Tour it might happen that you may accidentally knock an opponent's ball into a pocket, for instance, but still you will be allowed to keep playing your turn. And of course, you might be aware that you automatically lose the game if you pocket the 8 ball on the break. 3. Despite having a simple gameplay, there are many other features in the game.You can make use of your winnings or hard currency by buying Facebook credits and enter into time limited cues. There are different cues each with its strengths and bonuses. Once you clear 4 such venues, you can even participate in a weekly tournament. At the start the venue will cost you only a few single digit chips but as you proceed the currency requirement will go on increase and will go up to a thousand chips even. These all are some great features of the game but it would have been even better if the game allowed players to play in teams or place their own bets. We have had some information that such changes might take place in near future. A practise table is also on cards. In addition to these if there is inclusion of Cutthroat and Snooker table to then we have no doubt that this game is one of the most stable games to stay on Facebook.